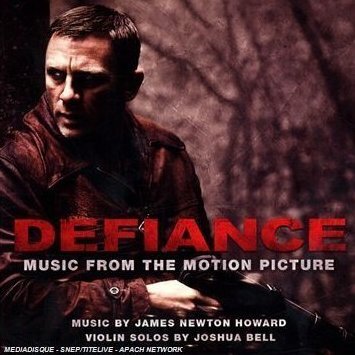 The original soundtrack for Edward Zwick's Defiance (2008) won Hollywood composer James Newton Howard his eighth Academy Award nomination. An honorary member of the Royal Academy of Music from 2008, Howard has been involved in the film industry since the beginning of his career. He became a loyal partner to directors such as Andrew Davis (The Fugitive, 1993), M. Night Shyamalan (The Sixth Sense, 1999; Signs, 2002; Lady in the Water, 2006). More recently, Howard has collaborated with The Dark Knight's director Christopher Nolan, and for this soundtrack he was awarded a Grammy award along with Hans Zimmer. Howard's latest collaboration saw him composing the score for Zwick's Defiance. Zwick brings to the screen the true story of the Bielski partisans, four Jewish brothers who, in an attempt to escape persecution in Nazi-occupied Poland, managed to create a community of Jewish refugees hidden in the Belorussian forests; their actions, unrecognized until recently, helped to save hundreds of lives. Zwick attempts both to celebrate the courage of these people and to problematise this tragedy of survival. As he himself has stated, his protagonists are 'flawed heroes, which is what makes them so real and so fascinating. They faced any number of difficult moral dilemmas that the movie seeks to dramatise' (The Times, 31 December 2008). Unfortunately, he does not completely succeed in exposing the story's ambiguities, occasionally falling into clumsy, aphoristic dialogue and uncertain characterization. Yet, if the director fails in allowing room for subtleties, Howard's musical interpretation is able to sustain a consistent line, exploiting the film's more stable points. One of the film's effective aspects is its reliance on space in order to create coherence: just as Zwick exploits the forest, using it as a thematic element (both a shelter, a place of community and an aesthetic background), so Howard is able to construct a musical space poignantly connected to the visual side of the narrative. In fact, the composer develops an orchestral texture based on some fixed recurrent elements, such as minor-mode tonalities and obsessive string figuration. Howard's predilection for strings is reflected in the presence of Grammy Award winning violinist Joshua Bell as soloist. Bell's interventions are sometimes rather circumscribed, as the few notes in 'Bella and Zus' demonstrate. Yet, probably thanks to this reticence, his presence becomes even more meaningful. Despite the harmonic unity that characterizes most of the score, a sense of progression is provided by the presence of contrasting pieces. One of them is 'The Bielski Otriad', in which drums and brasses become more invasive and give the score a new narrative twist. Another musical variation is offered in the closing piece, 'The Bielski Brothers/Ikh Bin A Mame', which is different from the rest of the soundtrack both by virtue of a severe piano solo and by the attenuation of the string work. The search for a symbiosis between visual space and music is evident in the collaboration between Zwick's and Howard's reading of the story. The most successful attempt is an apparently naïve moment: the arrival of the spring after the long Belorussian winter. The simplicity of this scene is striking: the camera lingers over rays of light on pine leaves, over the face of a woman enjoying the sun with her eyes closed, over snow melting. The music mimics this rebirth, in ascending phrases and luminous sonorities: timidly cheerful string staccati offer a few moments of relief after a musical texture that lays emphasis on tension and mourning. The music has been edited in order to present a suture between ambient noises preceding particularly emotional scenes, such as the announcement of a beloved's killing. In these moments, strings insinuate within close-ups of tearful eyes, to replace realistic yet intrusive ambient noises with a softer sense of mourning. On the whole, Howard's score is effective in supporting the film's structure and in maintaining its high technical quality. Joshua Bell's playing stands out within a very polished orchestral interpretation, one that on occasions seemed to be too mechanical.